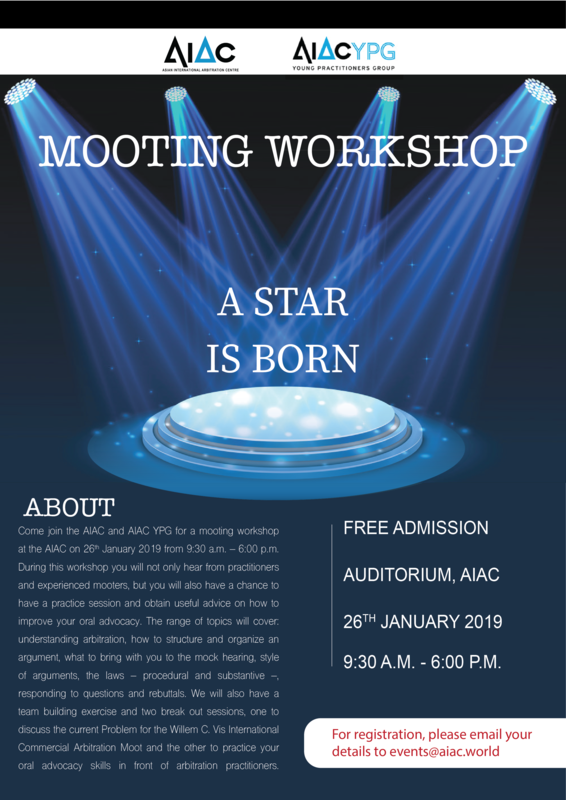 Come join the AIAC and AIAC-YPG for a mooting workshop at the AIAC on 26th January 2019 from 9:30 am – 6:00 pm. During this workshop you will not only hear from practitioners and experienced mooters, but you will also have a chance to have a practice session and obtain useful advice on how to improve your oral advocacy. The range of topics will cover: understanding arbitration, how to structure and organize an argument, what to bring with you to the mock hearing, style of arguments, the laws – procedural and substantive –, responding to questions and rebuttals. We will also have a team building exercise and two break out sessions, one to discuss the current Problem for the Willem C. Vis International Commercial Arbitration Moot and the other to practice your oral advocacy skills in front of arbitration practitioners. For registration, please email your details to events@aiac.world. Admission is free with limited seats available.